Every farming decision is long term, with perpetual renewal as the primary goal. 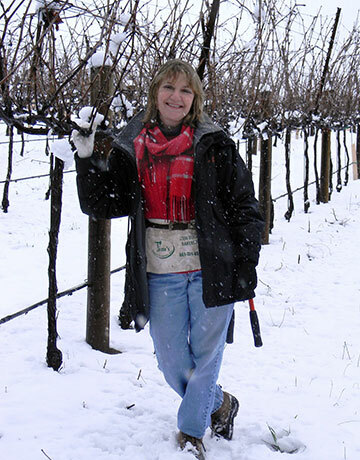 The most rewarding aspect of Linda’s work is to be out in the vineyard, smelling the grass as it brushes her boots, and touching the vines with each new season. I had a vineyard management company. 1978 Stags Leap Petite Syrah. Robert Mondavi. He dedicated all his resources to discovering better ways to grow grapes, make wine, and then made sure he shared all he learned with all of us. In my mind, he established a bar we can only strive to reach. Being in the vineyard, smelling the grass as it brushes my boots, touching the vines with each new season. Getting the wine into the hands of those who want it. Along with the winemakers, David and Katharine DeSante, we have committed ourselves to never cutting a corner and always looking for the best way in every process, from planting to packaging. The tremendous sharing of knowledge and help amongst all the vintners, growers and winemakers. Yes, the weather and soils are important, but it is really the cooperation and generosity of the people that makes this place truly special. My favorite way is taking people out into the vineyard. Letting them prune a vine, or caring for them in some other way. I would love to volunteer to help at major disasters. Faye Wilson, Taylor Franklin and Jesus of Nazareth. Either get an intern job at one of the major wineries and work your way up, working at several different wineries before starting your own brand, or bring lots of money. I am an open book. No one is surprised by me.